The corpse of a vampire is brought to a hospital where it is brought back to life and escapes seeking new victims. El ataúd del vampire / The Vampire's Coffin (1958) is a sequel to El vampiro / The Vampire (1957), though everything you need to know about the first movie is covered here, and even if it weren't the movie is so straight forward that knowing it's a sequel is really unnecessary. 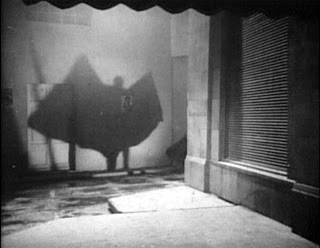 The movie starts out with some nice moody atmosphere, but once it reaches the hospital, antiseptic sets and lighting take over and we are presented with characters walking back and forth between rooms looking for the vampire, and taking breaks for romantic asides, or to try and inform the authorities, who refuse to believe a vampire is on the loose. There's something about the structure that suggests it's, at least partially, meant to be a comedy, but the laughs aren't there, and the movie as a whole becomes little more than a not very entertaining diversion.